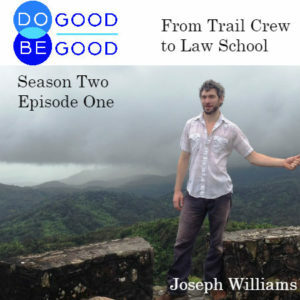 From serving on an AmeriCorps trail crew building the Pacific Crest Trail to going to law school and serving people who were mentally ill in San Francisco, through AmeriCorps JD, Joseph Williams has had an interesting career of service. Joseph currently works as a lawyer at a private law firm in Flagstaff, Arizona, but he got his start through National Service. For more information, visit http://dogoodbegoodshow.com. SHARON: Welcome back to Do Good Be Good. I am your host, Sharon Tewksbury-Bloom and this is our first episode of Season Two. Season Two is going to be all about National Service. Personally, in 2007, I served in AmeriCorps and it changed my life, but we’ll get to that in a later episode. This season is brought to you by Do Good, Be Good AmeriCorps webinar series and our studio host, Sun Sounds of Arizona. I have a great guest today and I don’t want to delay our conversation any longer. Today’s guest is Joseph Williams. He currently works as a lawyer in Flagstaff, Arizona, but before he went to Law School he decided to try something really hard and join an AmeriCorps trail crew. Sharon: I asked Joseph what led him to AmeriCorps. Joseph: I had a few dips into the shallow end of the working world throughout my twenties and teens. I mean I have always worked; I’ve worked since I was 15. Meaningful work didn’t start until after college. I am the only person from my family to go to college. I didn’t really pay attention too much to grades or career path, I just thought … Well, I mean, I am from a small town. I know how it works. I go to college and I get out and I get a job. And then I do my thing where it happens on TV or just like my parents. I assume I will just end up like my parents somehow, with very little effort. That ended up not being true. So I got to my junior year, my eighth year in college, [laughter] no I am just kidding, it was maybe my fourth year, but it was what they considered my junior year in college. I thought … I am not on the right track here. I either need to pump the brakes or take a detour and I need to do something totally different, because if I graduate right now I’m just going to be like puked out onto the sidewalk. So I decided to do something fun that I wanted to do. I just wanted to be outside. I wanted to work outside. I grew up working all the time, whether it be at home or actually having a paid job. I had this thing in my mind, this mantra, I want to work with my hands and I don’t think I will be able to do it after I graduate. If I am working with my hands after I graduate it means that college wasn’t necessary for me. I started poking around on the internet and I came across a job with the Northwest Service Academy. I went through the application process and the pitch was, basically I was going to go out and build things, build things outside on trails. I drove out to Trout Lake, Washington and thereafter learned that I was in AmeriCorps. I really was clueless at the time. I was just like a turnip seed fresh off the wagon. I was just introduced to a totally different group of people. There was a guy wearing a sari I think you call it, which is like a giant skirt. You are playing ultimate Frisbee and eating a lot of granola and textured vegetable protein… I was like “What am I doing here? This is crazy.” But it got fun really fast. As soon as we got to work… because whenever you do an AmeriCorps project, I assume, I have done AmeriCorps at least twice… twice… exactly twice.. [laughter]. In my experience, AmeriCorps usually begins with some kind of team building or some kind of group activity. So we started out doing soft stuff like, “Hello my name is this and I like doing that”, and let’s go do a silly game to make us all break down some barriers. And I was like, “I don’t know about this”, but then we started actually getting to work and we started doing some practice projects and it turns out that my project, that I was assigned after I showed up to Trout Lake was to go and build and repair and maintain sections of the Pacific Crest National Scenic Trail, which goes from Mexico to Canada through the three coastal states. Even though I was from a small town in the country and I was an outdoors person, I didn’t camp so much; I didn’t hike so much, I just happened to spend a lot of time outside. So I am having to get used to sleeping in a tent and living outside. We are practicing putting up our tents and doing this and that and tying knots and that’s all great and it’s fun. Then we start actually using our tools and swinging hammers and sledgehammers and I am like, “Ok, now I am having fun”. We weren’t allowed to use power tools because we were in wilderness areas and you can’t use anything mechanized there. So we are swinging hammers and using crosscut saws and rock bars, which are like giant levers to move rocks. We would go into the woods and spend anywhere between three and ten days camped out in the backcountry and we would sleep in our tents and we would cook for one another. We would be assigned a cooking duty for a hitch, which a hitch is the time you spend on the trail. You just rely on each other; and it was great. It was fantastic. I was on the trail for five months and had a bunch of different kinds of hitches. I slept in a tent for almost that entire time. I remember before that experience I had had trouble sleeping. I would wake up in the middle of the night and stay up for two or three hours and had trouble going to sleep. I just was not a good sleeper. I have slept like a baby since then. Cause you sleep on the ground for five months and you will never not appreciate a bed again. When I got done I was like, “I didn’t know I could do that.” You would get a lot of thank yous doing that job. You would thank each other; you had to appreciate one another. And you got a lot of thank yous from the people that were on the trail. People were constantly walking by you. There were three comments, when are they putting the escalator in? When are they putting the golf course in? and thank you. So we are all spread out, but we get together, we stay in touch. It was a strong bond. I mean we pooped in the same hole for five months, cooked for each other for five months, and knew every move each other made. Sharon: Yea, I did some wilderness trail work in the Bob Marshall Wilderness in Montana and we were clearing trails from trees that had fallen and crossed the trail. So we were using cross cut saws. SHARON: Not something I normally do in my real life. As my husband tells me, I am not a tool using animal. SHARON: He always says I am a device using animal, but not a tool using animal. JOSEPH: Yea, you are an indoor kid. SHARON: Yea, exactly. But I really liked it. I liked the parts that involved just getting into it with your whole body, just getting completely dirty. You would take this log that you just cut and then you would have to force it over… we were on a really steep mountainside, so if you could just get some momentum going, the tree would go on its own down the mountainside. JOSEPH: You are not talking about Jalen? Because he looks like Will Smith’s daughter, but he’s a man. SHARON: No, it was like a 12 year old girl singing this song. But anyways, it was surprisingly fun and ridiculous and when you are out in the wilderness and you haven’t seen people for two weeks and you get a little bit crazy and singing that song seemed like a good idea. JOSEPH: I went back and graduated college against all odds. A few years later I was in law school and AmeriCorps had a program called AmeriCorps JD. And AmeriCorps JD as far as I understand it provided scholarships for law school students to intern at public service organizations during the summer. That is what I did. I got a scholarship to intern with a group called the homeless advocacy project in San Francisco doing eviction defense for disabled people. SHARON: I feel like we are missing a critical step. How did you go from being on a trail crew to deciding to pursue law school? JOSEPH: I feel like it is a pretty natural next step. But no… I .. that’s tough… So I spent a lot of time after the trail crew. I went back to college and bartended and saved up money and that whole time I was thinking, What’s next? What’s next? I just kept repeating to myself that I just want to do something where if I weren’t doing it, people would notice. People would miss the thing that I provided. So I just wanted to do something where people needed me to do it. And that is broad and it can apply to anything, but to me it meant, I want to do something that was important and hard to do and that mattered and affected people’s lives in a positive way. And I guess that’s what it meant to me to say I want to be irreplaceable, or very important. I was talking to my dad and I said, you know what, I am going to go to law school. For me law school wasn’t something that I aimed for and wanted to do. And I never considered myself a suit. I didn’t want to be the straight man … mister keyboard. SHARON: I feel like since we are on radio I have to point out that you are not wearing a suit right now. JOSEPH: Exactly [laughter]. I use every opportunity possible to not wear a suit. I look more like a forest ranger today because I am wearing all green. SHARON: You do kind of look like a forest ranger [laughter]. JOSEPH: Yea, that’s what I am going for. I want people to think I am a forest ranger so I can answer questions that I don’t know the answer to. JOSEPH: But anyway, that was my path to law school. You could almost say it was as random as throwing a dart at a map with a lot of careers on it, but it fit into my… it fit into what I wanted to do. JOSEPH: If you prioritize people with disabilities in San Francisco, you are only going to serve people with disabilities cause there’s so many people with disabilities. So we only served people with disabilities and most of them were mental disabilities and a lot of them were bipolar, or schizophrenic, and marginally homeless. In San Francisco, there’s a housing option, called SROs, Single Occupancy Hotels… it’s complex how they work… It’s government housing, but it’s a giant hotel. It’s just one room apartments and it is filled with people who are eligible for these services. And if you are in San Francisco and you are eligible for these services, there’s a pretty good chance that you might be a little nutty. That’s the environment we were in; we were helping people not get evicted from single occupancy hotels which are apartments filled with people with schizophrenia and bipolar disorder. That’s not an insensitive way of saying that, that’s just what it was. That was great for me. I like working with people with disabilities. I grew up … my dad’s family is from a real small town in rural northwest Georgia and they don’t have a lot of money. A lot of them have disabilities, physical and mental disabilities. So poor disabled population, I grew up with that and I love it and I feel like I can relate to it. I didn’t know I loved it, and I didn’t know I could relate to it until I realized that other people can’t and I thought this is… these are my peoples. One specific story that I remember, there was a guy that came in. And usually when they come into my office I do an intake, and that is the initial interview where I get the facts of why they are being evicted and I usually get the facts from a piece of paper that tells them why they are being evicted. Their landlord would mail or nail or hand them a piece of paper that said, you are hereby evicted, you have five days to get out and here are the reasons for your eviction. It would be things like, “you were running down the hall with no clothes on and you threw mashed potatoes at all the doors and you were yelling and screaming at four am” that kind of thing. A guy comes in and hands me a piece of paper and we sit down and talk. And it’s that kind of thing, those were the kinds of things they say he is doing to be evicted. And we just have a conversation about it. He’s like, “yea, I am being evicted, here are the things they say I am doing, I don’t remember doing any of that stuff” and it’s a pretty good conversation. I am like, wow, I can’t believe they’re saying you did this stuff; you don’t seem like you would do these kinds of things… you are a nice guy, you are dressed ok, we’re having a regular conversation. We finish the interview and he goes along his way. I complete my day and I am on my way home. I am biking home on The Wiggle, The Wiggle is a bike path. I am biking up a hill and I see a man in the middle of the street. I am like whoa, there’s a guy there in the middle of the street, that’s not too good in the middle of rush hour and I get closer and it’s the guy, it’s my client. And he has his pants around his ankles and he’s urinating in the middle of the street, hands above his head and he’s screaming something or another. And I’m like, OK, that makes more sense, but I was so grateful because it was like, you had thirty minutes of sanity in you today and you gave them all to me. Thank you sir, thank you for donating your good moments to me today to just deal with this issue. SHARON: I asked Joseph what he thought it meant to be good. JOSEPH: To do good, to be good, means to perform an act that doesn’t negatively affect anyone else. That sounds like a passive way to describe being good or doing good, but I think to sit on your couch at home and do nothing does negatively affect other people, because you have this capacity that you and I have talked about that you learn from doing AmeriCorps or trail crew or doing whatever it is that you do to learn that you have this tool in your tool belt where you can solve problems. So it is not a passive definition of being good. If you are doing something that doesn’t detract from the world at large or hurt someone else, then you are doing something, you are doing something and it generates good outcomes. Sitting on your couch doesn’t help anybody and it actively hurts because you are just sitting there absorbing or consuming things, whether it be energy or oxygen or whatever and you are not helping anybody else and it doesn’t help the world at large and it actively hurts I think. So when you are doing a thing or performing a task and it’s not hurting anyone else, then it’s good. SHARON: That reminds me of the Hippocratic Oath, first do no harm. JOSEPH: Right, exactly. Do no harm. If you are not doing harm… and this might be a very binary definition of good, but if you are not doing harm than it must be good. SHARON: Thank you for listening to Do Good, Be Good. For show notes on all of the episodes, visit dogoodbegoodshow.com. If you want more behind the scenes stories and insights, check out the show page on Facebook at facebook.com/dogoodbegoodshow. Thank you to Joseph for coming into the studio and sharing his story. To subscribe to the podcast so that you get that episode as soon as it is released, search for Do Good Be Good in Apple Podcasts, Stitcher, Google Music, or your podcast app of choice. This podcast was produced with help from Sun Sounds of Arizona. Music in this episode is Bathed in Fine Dust by Andy G. Cohen, Released under a Creative Commons Attribution International License and discovered in the Free Music Archive. Until next week, this is Sharon Tewksbury-Bloom signing off.